Potassium Humate – HCM Agro Products Private Ltd.
Potassium Humate is extracted from natural leonardite. 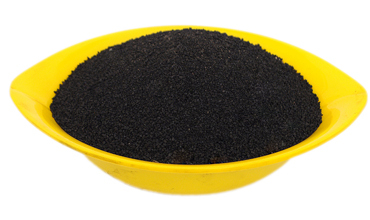 It is black powder, flake or crystal granular, soluble in water, which perfectly combine humic acids and nutrients. It improves the structure of soil, increase the buffering power of soil. Optimize N,P,K absorption by plants. Potassium is an important component of chlorophyll, speed up the photosynthesis. Enhance the resistance of crops such as cold, drought, pest, disease and toppling resistance. Enhance nutrient uptake by combing nutrients with humic acids and keep a well-balanced nutrition. Improve soil structure increase ion exchange capacity of soil. Prevent soil from contamination of heavy metallic ions as well as other harmful matters. Used as multi-functional compound fertilizer, combined with Nitrogen and Phosphorus, also used as basal fertilizer, top dressing, seed fertilizer, foliar fertilizer and spray fertilizer. We are basically serving the agricultural sector and our prime emphasis is upon product management and enhancement through latest development technology. We supply our products to different corners of the country and also to a number of overseas clients. We have attracted retailers and farmers with our innovative range, our commitment to quality, strict deadlines and delivery schedules. © 2018 HCM Agro Products Pvt Ltd. All Rights Reserved.